When using data which has been provided by PDS in publications and research, we encourage you to cite PDS as the data source. If you need further guidance for citing a data source, please contact the PDS Operator at pds_operator@jpl.nasa.gov. Proper documentation of data sources is important in scientific research. Source checks are one of several methods for assessing the soundness of analyses and for extending the work reported. Should there be questions about methods or conclusions, unambiguous source information simplifies replication (and defense) of the initial report. The Product ID of the particular product (as referenced in the product's PDS label). Both of the above IDs are usually included in the PDS label; some older PDS data sets may not have a Product ID. When referencing PDS data in publications or presentations, please provide an acknowledgment so that proper credit can be extended to NASA, its missions, science data providers, and/or their partners. Examples are provided below for general acknowledgments, data set citations in a reference listing, and online web images and other data. General acknowledgments and web citations are appropriate for use on either a web page or in a presentation. The more formal reference citation should be used in a journal article. The VG1/VG2-SR-ISS-4-PROFILES-V1.0 data set was obtained from the Planetary Data System (PDS). Data and support were provided by the PDS Cartography and Imaging Sciences Node. See Eliason, Eric M., Susan K. LaVoie and Laurence A. Soderblom, The Cartography and Imaging Sciences Node for the Planetary Data System, Planet. Space Sci., Vol. 44, No. 1, pp. 23-32, 1996. Data and assistance were provided by the Navigation and Ancillary Information Facility. See Acton, Charles H., Jr., Ancillary data services of NASA's Navigation and Ancillary Information Facilty, Planet. Space Sci., Vol. 44, No. 1, pp 65-70, 1996. Murchie, S., Mars Reconnaissance Orbiter Compact Reconnaissance Imaging Spectrometer for Mars Limb Data Record, data set MRO-M-CRISM-6-LDR-V1.0, NASA Planetary Data System, 2010. Gaskell, R.W., Gaskell Eros Shape Model V1.0. NEAR-A-MSI-5-EROSSHAPE-V1.0. NASA Planetary Data System, 2008. Esposito, L. (et al. ), Cassini Ultraviolet Imaging Spectrograph Jupiter Flyby Data, NASA Planetary Data System, CO-S-UVIS-2-WAV-V1.0, 2005. For rules and more examples, see Chapter B.32 of Appendix B in the PDS Standards Reference. New Horizons Long Range Reconnaissance Imager image of Jupiter, PDS Planetary Ring-Moon Systems Node archive. 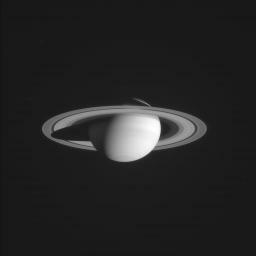 Cassini Orbiter image Saturn rings, PDS Cartography and Imaging Sciences Node archive. Mars images were obtained from the PDS Cartography and Imaging Sciences Node. Data were obtained from the PDS Geoscience Node and the PDS PPI Node.